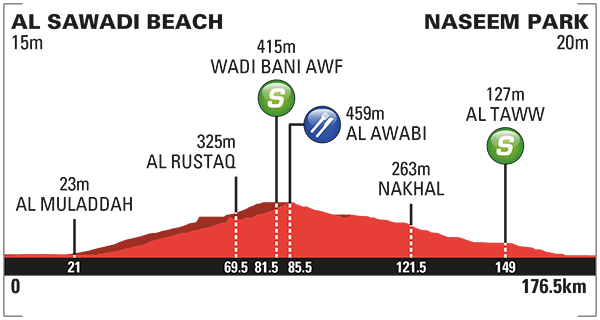 The sprinters should come to the fore on Stage 3 of the Tour of Oman, stealing the limelight back from the puncheurs and climbers who have dominated proceedings up to now in this race. The latter part of the day rolls downwards to the finish at Naseem Park after 176.5km of racing, likely to prove the perfect drag race for the fast men to contest the win. Alexander Kristoff is sure to be the man to beat on Stage 2, the Norwegian appearing strong once again at the early part of the season and is surely poised to add to his 2016 tally. Edvald Boasson Hagen’s form has been scintillating so far this year and cannot be discounted from featuring here despite the lack of ideal terrain for the current race leader. Moreno Hofland is certainly a man to watch here as the leadout train at his disposal could rival that of Katusha if everything goes well, though he will really need to be on top form to better Kristoff in the anticipated sprint. Posted on February 17, 2016 February 21, 2016 by Spokenforks	This entry was posted in News and tagged Alexander Kristoff, Dimension Data, Edvald Boasson Hagen, Katusha, Moreno Hofland, Official, Preview, Spokenforks, Stage 3, Team LottoNL-Jumbo, Tour of Oman. Bookmark the permalink.